An unidentified employee works on the assembly line at the Beijing Automotive Industry and Hyundai factory in Beijing, China, last month. 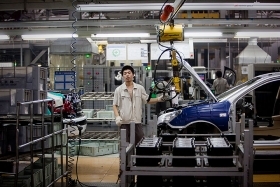 Hyundai said today it will build a third assembly plant in China and that it is scheduled to open in 2012. (Bloomberg) -- Hyundai Motor Co. will build a third assembly plant in China with capacity to make 400,000 vehicles a year to meet rising consumer demand in the world's largest auto market. The factory will boost Hyundai's production capacity in China to 1 million vehicles a year, the Korean automaker said in a statement. Construction of the plant, to be located in Beijing, is scheduled to be completed in 2012, according to the statement. Hyundai Motor aims to boost sales in China to 670,000 vehicles this year from 570,000 last year, as the nation's growing economy spurs demand for new automobiles. The automaker sold about 437,000 units in the country during the first eight months of the year. Noh Jae Man, president of Hyundai's Chinese venture, said in November the automaker was planning to spend about $800 million to build a third Chinese plant that would be completed in 2011. The factory would make cars larger than subcompacts and have capacity of about 300,000 units, he said at the time.